There was a special guest at the state capitol on Thursday night. ANNAPOLIS, Md. — There was a special guest at the state capitol on Thursday night. Former New Jersey Governor Chris Christie was in town promoting his new book. The book is called Let Me Finish...Trump, The Kushners, Bannon, New Jersey and the Power of In-Your-Face Politics. As soon as he got off the train, Christie and Maryland Governor Larry Hogan answered some questions at the governor's mansion. The first thing, what do people say about Hogan's leadership across the country? “That he’s a uniter. The thing I hear more than anything else about Larry Hogan when I travel around the country is a kind of sense of wonderment on how did he bring such a diverse state together with his incredible approval ratings, his smashing re-election numbers. People are like, how did it happen? 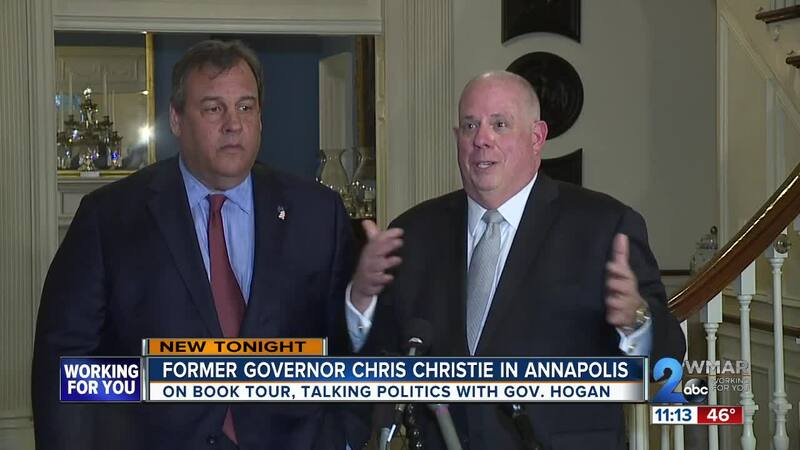 because people don’t expect it to happen for a Republican in Maryland,“ said Christie. The biggest question posed to both governors, will Hogan challenge the President in the primaries? “Listen, I’ve made it real clear that previously that I think Larry has an extraordinary future as a leader of our party nationally. I’ve also said, that I think he’s said as well, I don’t see a political path at the moment for challenging the president in a primary,” said Christie. “Look, a lot of other people are talking about it. I haven’t been talking about it. Governor Christie said it exactly the way I’ve been saying it. Currently it doesn’t make any sense of all, but we just don’t know what the future holds and don’t know what that might look like several months from now,” said Hogan. Hogan has said in the past few month that he hasn't completely ruled out a potential primary challenge.